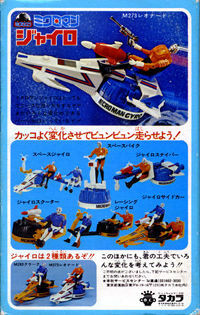 Front and back box art to the Microman Gyro. There are two Gyros, as shown on the back of the box. This one is the blue and white version, which came with M273. The Gyro is kind of a strange vehicle; it is supposed to wobble around in platform mode, or it can be a spaceship with the addition of a few extra parts. The box art itself is a bit atypical for Microman packaging at the time. 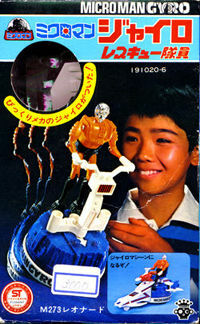 It features a small boy on the front, playing with the toy. This approach is used on a much broader basis for the post-1980's Microman box art. The actual Gyro can be seen by browsing the Interesting Pieces section of the site, or by going directly to the Gyro page.